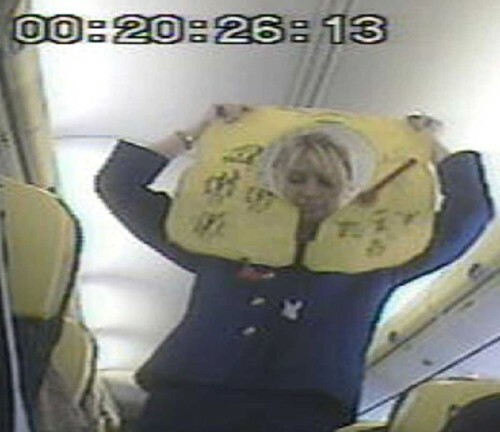 THIS is the picture that gives the title to an expose of cut-price airline Ryanair. 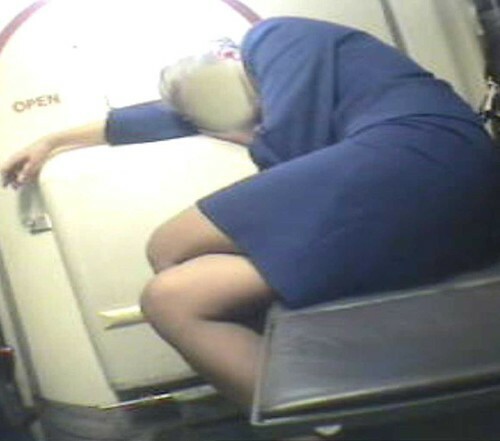 The woman slumped across two seats was one of a number of exhausted members of cabin crew filmed fast asleep instead of working during flights. Amazingly, this woman would have been one of the cabin crew charged with helping passengers in the event of an inflight emergency. A string of safety and other issues are highlighted in tonight’s Channel 4 Dispatches programme, Ryanair Caught Napping. A pilot too terrified to tell bosses he’s tired for fear of being sacked or demoted is quoted as is a member of staff filmed splashing aftershave on vomit left in a row of seats rather than either clearing it up or closing the row of seats. Ryanair Caught Napping also contains claims that one flight flew with a faulty Global Positioning System while another took off despite having a faulty emergency exit. The 8pm programme is the culmination of five months investigation by two undercover journalists posing as cabin crew. All the claims made by Dispatches are hotly refuted by airline boss Michael O’Leary. Ireland on Sunday reported yesterday how O’Leary answered each claim by the programme makers on the airline’s website. He said: “We have received a series of untrue and unsubstantiated claims which (Channel 4) have failed to support with any evidence. A Channel 4 spokeswoman told the Irish Daily Mail last night: “We stand by our programme 100 per cent. The video footage that is used speaks for itself, regardless of what Mr O’Leary says about us. “The undercover footage reveals what takes place behind the scenes: security lapses, dirty aircrafts, pilots complaining about the hours they have to fly and exhausted cabin crew. The programme also shows a sequence in which passport checks are discussed. Amazingly, despite heightened concerns all over the world about terrorism, a senior member of staff told one of the reporters that a passport check effectively amounted to just making sure the passenger had one. They are filmed telling the reporter: “We are full all day. So when I let you know, you go and you board. “And you board straight away, there’s not waiting, you board, you’ve got 25 minutes to do it. You’re checking have they got the right flight number on the boarding card. The programme comes amid a string of criticism about working practices at Ryanair. As well as attacks by unions for making trainee staff pay for their uniforms and in-flight meals, the airline’s handling of safety issues has been called into question. Two incidents last year involving Ryanair pilots are believed to have been among the reasons which prompted the head of the Irish Airline Pilots Association(IALPA) to question the adequacy of Ireland’s air safety procedures. He was speaking after Italian authorities attacked Ryanair for delaying an investigation into a series of irregular approaches into Rome last September by the crew of a Ryanair Boeing 737-800. As a consequence, the investigation was delayed by four months – and O’Leary had to admit his company had “screwed up” over its handling of the affair. The company’s own report pointed to the crew’s “almost complete loss of situational awareness, both lateral and vertical” and blamed this on a failure by its own pilots to follow standard operating procedures. In July last year, another Ryanair crew were rapped for carrying out an “an irrational and inexplicable” steep landing approach to Stockholm’s Skavsta airport. The pilot of the plane – which touched down at 330km/h in an incorrect “configuration” – was found to be suffering from stress, as was one of the pilots involved in the September 2005 incident at Rome. 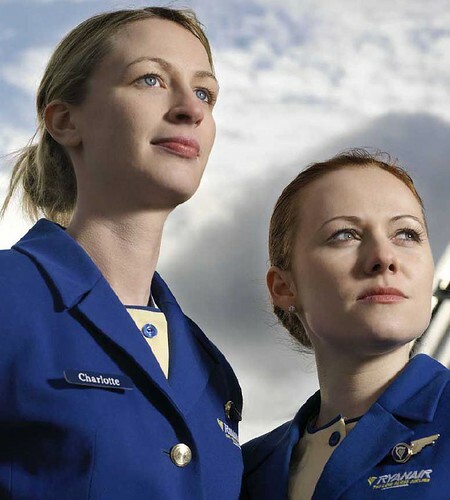 Where does anyone insult this cabin crew? Stop getting all so fessy….!!! all jobs have to have a break in them somewhere, so what if the stews want to take a nap, its their time, let them do what they want. Seriously ahut up, Ok they dont have the longest sectors in the world, but low-cost is harder because there is more landings and takeoffs invloved! I work as cabin crew for ryanair and is essential that we take at least a 15-20 minute sleep on all long flights and long shifts … what chanel 4 has done here essentialy is that they have takin 3 or 4 tiny bits of information ( Not all true / fabricated / no hard evidence to provide ) and put them together into a documentry to fill a gap on there already boring chanell ( Find something good to film then put it on tv ) in case u didnt kno people dont like watchin or hearing lies . I find this almost insulting. I dont work for Ryanair, but I do on part for them. Channel 4 have found small pieces of evidence and made it sound like the whole airline are doing this. Scaring the public or what! This is so un needed. Channel 4 please find something else to investigate rather than trying to douse companies in disrepute because you dont like them. Whoever the fool was to take that picture must know that, IT IS NOT FORBIDDEN TO TAKE A QUICK NAP because on those planes they use 6 crews, 2 pilots, 4 stews, so if one sleeps there are other 3 left to do the job, Stewerdesses are people too. Now, if the pilots both sleep I am more concerned but if a stew needs to shut an eye for a bit (if you say she slept during the whole flight you lie) doesn’t harm anyone. I am cabin crew myself for another airline, not low cost and the hours are hard, and if we do have a late night flight, we will take it in turns to have a quick nap, but there are always crew members awake at all times, to deal with anything, it is not illegal for crew to have a quick nap infact it is law to have rest during a long flight or long shift, but only one crew member can sleep at any one time and then its only for 15 minutes, you try doing the job before you discriminate against cabin crew, i feel for them they sectors are extremley hard, all of ours are, so dont be so hasty to jump on the band wagon.